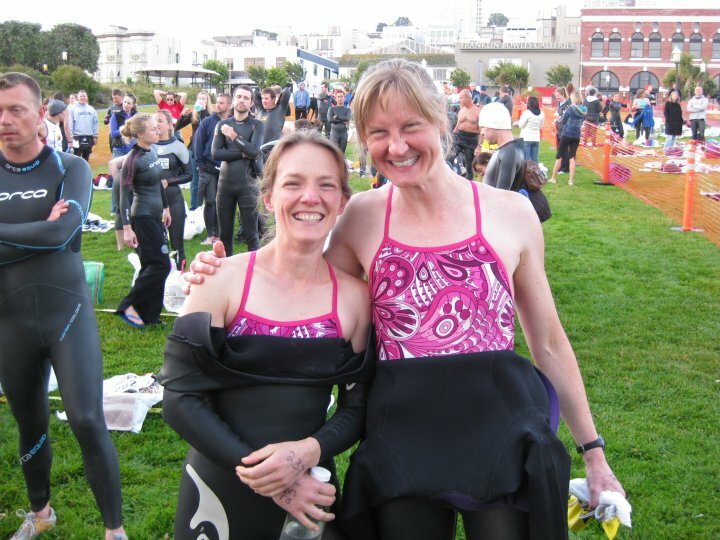 Yesterday’s swim reminded me that being well-trained for an event (like swimming from Alcatraz) is very important. I wasn’t well trained and I paid for it! I agreed to swim on a relay team as a replacement 10 days ago. My reasoning was, I’m in great shape and I’ve done this swim before, so why not. I did actually think about not having swum 1.5 miles in a long time and that the added factor of waves and current would make the swim that much harder. I somehow reasoned through all of that and found myself at Aquatic Park at 6am Sunday morning. breathing because the sun was too bright to my left and I was getting seasick. I kept close track of the lead boat with orange bouys to prevent ending up on the far right side of AP and missing the entrance back into the park. There were lines of swimmers and kayakers far to my right so I figured I was definitely on track. As I got more tired, my calves started taking turns cramping up. I stayed calm and treaded water then kicked lightly to work each one out. It was painful but I realized after the fact that I never panicked because I’m so comfortable in open water. Panic out there would have been disastrous and my ability to stay calm was all I had going for me. At some point during sorting out my calf cramps and clearing my goggles for the umteenth time, I suddenly wasn’t on track any more. I have no idea when or how it happened but I was pretty fatigued by that point and have only the memory of AP getting closer and closer then finding myself on the wrong side of the entrance. I realized there were rescue boats, including the SFPD and fire departments all over the place and swarms of swimmers pulling hard but not moving anywhere. We were all stuck to the right of the mouth and the current wasn’t allowing us to move. I gave it a good hard 10 minutes of effort then flagged down a boat. After the boat pulled me in, I got a good overhead view of the mess. The kayakers were swimming in every which way, also not dealing well with the current and confused about how to help swimmers. One almost rowed over a swimmer and another heard a swimmer yelling for help but didn’t do anything about it. When our boat was full with me and 7 guys, the driver zipped us straight across to the other side of the mouth and left us. During the time I was in the boat, I realized I was in trouble physically, but I didn’t want to call it quits because my entire relay team would have been disqualified, so I jumped back in with the rest of them. I attempted breath stroke as I felt myself get weaker and weaker, willing my calves not to cramp and taking deep breaths. I could see the end clearly by this point and each time I felt like I couldn’t go any further, I told myself, my fiance was waiting on shore and he’d be there to take care of me when I finally made it out of the water. I did breath stroke most of the way in from there because I felt seasick turning my head each time I went back to freestyle. I finally just put my head down and swam and then found my feet on solid ground. I stumbled out of the water and walked up to where my runner was waiting to grab my ankle tag and head to the bike transition area (he had to run four miles to get to the bike start, then after our biker did 3 hard loops on the bike, he ran another three miles, including the famous baker beach sand steps). My finace greeted me with other friends, including the swimmer who’d offered me the relay slot and KM with Birch. I have to mention that my swimmer friend was a rock-star. She made it from Alcatraz to land in 35 minutes, without any assistance, only seven minutes behind the lead swimmer!! I was well cared for, once back on land, and finally thawed out after a good hour. I forced myself to eat and drink and kept walking, supported by finace, because I might have fainted had I sat down. After a while, I began to feel better and our entire crew moved toward the bike/run transition to cheer the rest of our teams along. I wasn’t able to stay and see my team finish because I need to get ready for work. By the time I was actually sitting and playing my afternoon show, I was feeling exhausted and tired but more or less, back to normal. This is the worst I’ve ever felt during/after a race (except for mile 90 biking in my ironman, but that’s another story). I am more determined than ever to do this swim again and make it to shore without assistance. I’m two for two on boat rescue but next time I’ll sign up early and be prepared and pay more attention to my sight line! This time I’m simply happy to be done and I’m on my way to an accupuncture/massage appointment. The only things sore on me today are my calves! I rode to Aquatic Park this morning to meet a friend for a swim. My motto with swimming in the bay: misery loves company. Fortunately, today the water didn’t seem as cold as usual (maybe it was in the upper 50s!) and the sun was warm. However, halfway through my second loop, the tide got weird and I started swallowing too much water. I had no qualms about cutting the swim short and moving on with my day. The problem for me is always getting my wetsuit off using numb hands and feet. I did my usual beach dance, pulling and tugging and nearly falling over a few times but I eventually got the thing off. Then I decided to head behind a construction truck to change back into my biking gear. I wrapped myself carefully in my towel and started maneuvering, then looked up and saw a row of construction workers on their lunch break. And I thought I was being modest, moving away from the main crowd of families! My bike home included a stop for coffee at the Warming Hut, which was swarming with moms and baby stroller. I eventually enjoyed a coffee with a view then made my way home. I realized today that I can’t really fill in the blank because there are so many possible answers. I was absolutely thrilled to be laying on the beach (who wouldn’t be) but I was just as excited to be home in San Francisco with my fiancé again. It is quite easy to feel blissful when on vacation and truely believe that everything that can happen will be good. Less easy is it to keep this feeling when back in daily life… unless daily life is my bliss- even those things, which when thought of in logical terms, seem slightly less blissful. 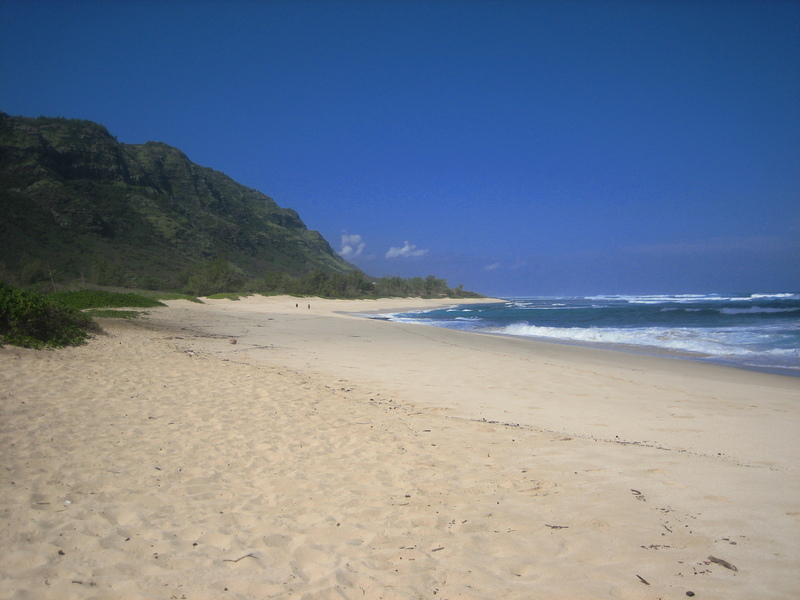 For example, open water swimming in Hawaii means heading over in flip flops and diving into very comfortable water. Open water swimming in San Francisco involves possible fog, possible drizzle and water in the mid 50s. And let’s not forget the wetsuit that us difficult to get in and nearly impossible to wrestle off with frozen hands, numb feet for the next hour and gunky black stuff which I may find caked to my face or blown out of my nose. So really, doesn’t that sound like a blast? Actually, it sort of is. Next time I head to aquatic park I’m going to remember that I like swimming in the bay before I go through all that trouble of dreading it. Wouldn’t that be an easier way to go through life? The yoga practice was short, as we were heading out on a Lost tour (!) but I already noticed my flexibility coming back. Maybe I was allowing more release after I saw that yesterday’s practice didn’t hurt me. Still congested and coughing by the end of my swim but My lungs are definitely clearing up. I’m flying home tonight. I plan on hydrating before and during the flight, and trying to get some sleep.